Instead of spending big dollars to buy strawberries at your local grocery store, consider learning how to build a strawberry planter so you can grow your own. Since there is no travel distance from far away fields to your table, homegrown strawberries reduce your carbon footprint and are better for the environment. The fresh-from-your-backyard taste far surpasses anything you can buy at a store and the satisfaction of growing your own makes the berries even sweeter. Strawberry planters are inexpensive to construct and with a bit of lumber and few tools, you will be planting in no time. Only use untreated lumber for growing fruits and vegetables because you do not want chemicals from treated lumber to leach into your food and cause potential health hazards. The basic planter has several openings, which allows multiple seedlings to grow in the same planter. Since strawberry plants typically grow low to the ground, planting them in a tower allows more plants to grow in a much smaller space. This is especially useful for gardeners who live in apartments or small homes without much yard area. Cut four pieces of two by two lumber into 24-inch lengths. If you do not own a handsaw or prefer not to spend time cutting, opt to have lumber cut at the store. Most home improvement stores, such as Lowes and Home Depot, will make the first two cuts for free and charge a nominal fee for any additional cuts. Make sure you have all the measurements ready at the time you purchase the wood because cuts cannot be made on previously purchased material. Cut four pieces of two by two lumber into 18-inch lengths for the second tier. Repeat for the third and fourth tier by also cutting the lumber into 12-inch and 6-inch lengths. Construct each square by screwing together the square frame using two deck screws on each side. Be sure to build your planter on a flat surface so the frames will be level. Once all four squares are built, layer each on top of the other at diagonal angles. Attach the second tier to the first tier using a deck screw sunk at a 45-degree angle at each corner of the top tier. Repeat for each successive layer by turning each square on the diagonal and attaching the layer beneath. Paint or stain as desired. The planter will be heavy once the soil and plants are added, so moving it is not recommended. If you plan to move your planter at any time during the growing season, it is advisable to add a bottom of one-half inch plywood during assembly to prevent soil and plants from being disturbed. Now that you learned how to build a strawberry planter, it is now time to plant your berries. Since you won't be planting a large amount of berries, choose the ever-bearing variety so you have a continuous harvest. Add equal amounts of peat moss, potting soil, and compost to the planter and water until the mixture is moist. 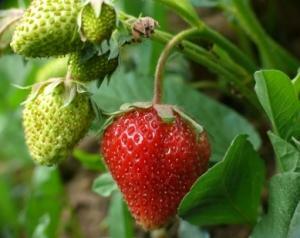 Dig a small indention in each opening and insert the strawberry seedling. Cover with soil and press firmly. Repeat until each opening has been filled, then water lightly. As with any container or raised bed garden, the soil tends to warm faster which also means it can dry out quickly. Check soil frequently by inserting a finger about an inch or two into the soil. If it feels dry, then water. Otherwise leave the plants alone and check the next day. Overwatering may cause roots to rot while under watering prevents blooms and fruit from forming. Make sure your strawberry plants get enough sun and water and you should be enjoying cobblers, pies, and milk shakes with your homegrown harvest soon.